This week’s lesson misses the point entirely because it is based on the worldview that says we must progressively overcome sin in order to be fit for heaven. No matter how much Adventists water down their core doctrines, the belief persists that sin must be overcome, that Jesus was our example of how to resist temptation by praying and relying on the Holy Spirit. 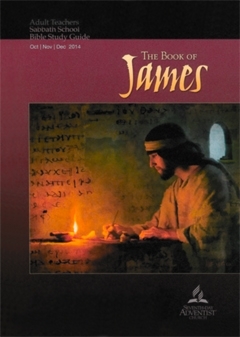 This understanding is the only possible way Adventists can understand sin and righteousness because they do not believe humans have spirits where sin either keeps the person dead or where sin is removed by the sacrifice and resurrection of the Lord Jesus, rendering one alive and transferred out of the domain or darkness into the kingdom of the Beloved Son (Col 1:13). Unless we understand that humans have spirits that are either dead (as we all are by nature—we are born dead) or alive through faith in the sacrifice of the Lord Jesus, fighting sin is hopeless. A natural person is one who has not been born again. Sin reigns in every single person until one repents and believes that Jesus completely paid the price for one’s sin. When we give up our right to control our lives and behaviors by rigid management and admit our complete depravity, throwing ourselves on God’s mercy, only then do we truly have a choice of any kind. A natural human has no choice. Everything a non-born again person does, whether it is base transgression or the most self-disciplined act of altruism is as filthy rags. No amount of self discipline and deprivation, of penance or prayer will result in a person sinning less or producing an act of goodness which God will acknowledge as good. Paul was clear that every bit of his legal perfection as a Jew (he stated that he was faultless according to the law) was as filthy rags (Phil. 3:2-11). As a natural, non-born again person—no matter how much righteous knowledge or sincerity we have—we cannot overcome sin. Oh, we might succeed in controlling some bad habits, but we do not overcome any sin that way. We only prove that we have tightly managed behavior. We are still dead in sin. Jesus didn’t come to make bad people good; He came to make dead people alive. It is only when we recognize our utter helplessness to improve, no matter how much discipline we exercise, and throw ourselves on the mercy of the Lord Jesus, that we receive life. When we believe in the Lord Jesus and accept His sacrifice for our sin, we receive His resurrection life, and we pass at that moment from death to live (Jn 5:24). It is then, having believed, that we are sealed with the promised Holy Spirit who guarantees our eternal future (Eph. 1:13-14). It is at this point that God transfers us from the domain of darkness into the kingdom of His beloved Son ()Col 1:13). When we are born again we are completely new in our spirits. We do not have two natures; we have a new heart and a new spirit, as God promised we would. The irony, however, is that we are saved and made eternally alive while still housed in “mortal tents”, as Paul calls our bodies (2 Cor. 5:1-10). Our bodies still have a “law of sin” in our members (Rom. 7: 23). When we are born again, we FINALLY have the ability to choose to submit our sinful flesh to the Lord Jesus at the moment of temptation. Before we are born again, we absolutely cannot do this. We are unable to submit to the One who can help us because we are dead. Our only submission, as dead people, is to repent and receive His forgiveness and life. Once we have been born again, however, we can submit our temptations to Him. Romans 8 explains how we learn to live by the Spirit. We submit to the truth in His Word when temptation hits, allowing His truth to inform our emotions and desires. We can learn to allow God to take the moment instead of acting on our impulses. We can submit to Him and ask Him to show us how to honor Him instead of simply reacting. We will never perfect our submission and obedience to the Lord Jesus in this life. We will mature and grow, but we will never overcome sin because as long as we have our mortal tents, we will live with a law of sin in our members. Nevertheless, it is not our sins that determine whether or not we are saved; it is our relationship to the Lord Jesus. If we have trusted Him in repentance, we have His life in us. We are no longer defined by our inheritance in Adam as sinner. Instead, we are God’s Spirit-born children who are also adopted by the Father and promised an eternal inheritance. It is our life in Jesus, not our sin, that determines out eternal future. Adventism teaches utter hopelessness. Not only do Adventists believe that they are merely bodies with breath, but they are also taught that it is a sin to say or believe that they are eternally saved. In truth, we are bodies plus spirit. Our spirits are naturally dead; they must be brought to life by faith in the Lord Jesus. If we have never trusted Jesus, we remain dead even while our bodies live their lives. We are unreconciled to God and without life or hope as long as we do not trust Jesus. When we do trust Him, however, we pass from death to life, from the kingdom of darkness to the kingdom of the Son. This complete newness of life gives us the ability to submit instead of to indulge the flesh. When we have been born again, we no longer have to fight sin directly. Instead, we surrender it and surrender our temptations. We lean on the Lord Jesus and allow Him to give us His strength and desire to honor Him instead of indulging ourselves. Sin is our entire identity unless we are born again; no amount of discipline or prayer will make us good. Only the Lord Jesus is good. When we trust Him, He credits His own personal perfect righteousness to our account. God looks at us and sees His Son when we are alive in Him. He counts us righteous even though our flesh is still mortal. But we are not considered righteous because we are eliminating sin. Rather, we are considered righteous because we are alive in Jesus, reconciled to the Father and washed clean by His blood. We are adopted and guaranteed our future (Rom. 8:14-17). Copyright 2014 BibleStudiesForAdventists.com. All rights reserved. Revised October 8, 2014. This website is published by Life Assurance Ministries, Camp Verde, Arizona, USA, the publisher of Proclamation! Magazine. Contact email: BibleStudiesForAdventists@gmail.com.